JANSSONIUS - Totius Sueviae novissima tabula. JANSSONIUS, J. - Totius Sueviae novissima tabula. Totius Sueviae novissima tabula. - JANSSONIUS, J. 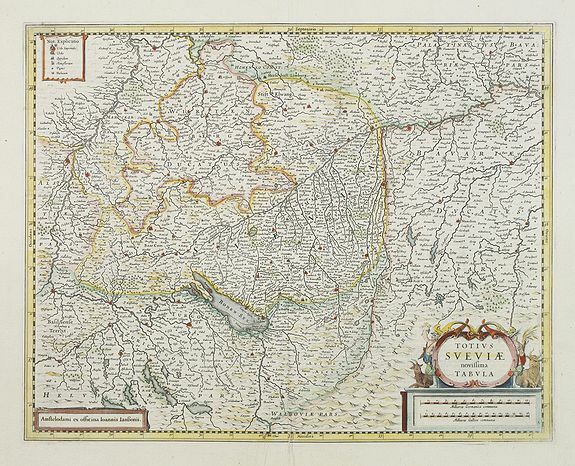 Title : Totius Sueviae novissima tabula.. Size : 14.6 x 18.8 inches. / 37.2 x 47.8 cm. Description :Beautiful map of Swaben, including Heidelberg, Ulm, Augsburg, Stuttgart, Basel, Zürich, Lucerne, Boden See and Lake Constance. Condition : Printers crease in lower half next to center fold, hardly notable. Small spot on verso underlaid due to paper thinness. In good condition. Paper very slightly browned.